Maximum size: about 75 mm (Hoover, 2006). Identification: The notum of this species is covered with rounded tubercles, some of which are distinctly darker. The lighter creases between the tubercles give it a reticulated appearance. The background color ranges from light orange to dark wine-red. In the latter animals, the contrasting dark tubercles may be difficult to see. Very young animals are reticulated with white lines, lack darker tubercles and have violet tipped rhinophores. With growth, the lines disappear, scattered tubercles darken and the violet tips disappear. It can be distinguished from Pleurobranchus varians by its larger, more rounded tubercles and its contrasting dark tubercles. Natural history: Pleurobranchus cf. peronii is a common nocturnal species found in moderately exposed to highly exposed rocky habitats and in Halimeda kanaloana beds. It occurs in tide pools and subtidally to depths of 18 m (59 ft). It contracts its rhinophores rhythmically while crawling and lays a cream, spiral egg mass with a frilly margin. Distribution: Big Island, Maui, Oahu, Kauai, Niihau, French Frigate Shoals, Pearl & Hermes Reef, Midway and Kure; widespread in the Indo-Pacific. Taxonomic notes: This is the species listed as Pleurobranchus sp. in Bertsch and Johnson, 1981 and Pleurobranchus sp. 1/Pleurobranchus sp. in Hoover, 1998 & 2006. It's referred to as the "polygon pleurobranch" in Hoover, 1998 & 2006. It may have been first reported from Hawaii in Pease, 1860 as Pleurobranchus reticulatus. (Note 1) Although Goodheart, et. al., 2015 tentatively suggests that P. violaceus is a synonym of Pleurobranchus grandis, it also seems possible that Pease's animals were P. cf. peronii (due to ambiguity in the description and the likely depth of collection). Although this species matches the description of Pleurobranchus peronii in Kay, 1979, the photo of that species is actually of the dark form of P. varians, instead (as is the photo in Kay & Schoenberg-Dole, 1991). It's also listed as Pleurobranchus violaceus in Edmondson, 1946. 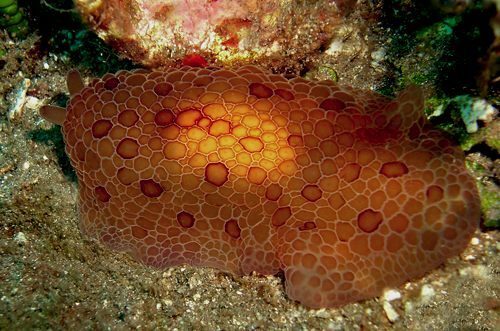 (Note 2) Many sources spell the name Pleurobranchus peroni. Photo: Michelle White: about 55 mm: Mala Wharf, Maui; January 1, 2009. Note 1: Kay, 1979 lists P. reticulatus Pease, 1860, non Rang, 1832 as a synonym of Pleurobranchus violaceus Pease, 1864. The latter name was proposed by Pease in 1863 as a replacement for P. reticulatus due to pre-occupation. Note 2: Goodheart, et. al., 2015 recovered all Indo-Pacific populations as a single taxon (Pleurobranchus peronii). However, Indo-Pacific animals appear to fall into two distinct groups: a "large tubercle form" with noticeably larger tubercles in adults (as well as early development of secondary tubercles in juveniles) and a "small tubercle form" with noticeably smaller tubercles in adults (as well as late development of secondary tubercles in juveniles). All Hawaiian animals found to date are of the "large tubercle form". However, both forms are sympatric in Reunion, French Polynesia, Australia and Japan. Juveniles and adults in those regions seem readily distinguishable although intermediate-sized animals (where the "trajectories" of tubercle development overlap) are sometimes ambiguous. Considering that pattern, it remains possible that future DNA work (using more genes?) could split the species. Cuvier's original figures appear to show the "small tubercle form." So, we are retaining the "cf." pending further work.